Hey guys, this is my first blog post here at TheHungryJPEG.com and I’m very excited about it! To be able to speak to you all so directly and offer advice, inside information and my own personal thoughts on everything TheHungryJPEG related is going to be really fun! I wanted to start by saying how much I care about the end user of our products, being a font addict myself, I know that buying and downloading tons of resources gets both confusing and disorganised very quickly! We work very hard to ensure that the accompanying guides with our bundles are useful and in depth with the goal being a pleasurable experience and not a ‘where are the files? !’ Nightmare! With that in mind, I want to share with you my thoughts on our latest bundle ‘The Big Bold Bundle’ which was so much fun to create and is ideal for people looking for more masculine fonts. However, just because the fonts may be described as ‘Masculine’ doesn’t mean that you cant create super sweet designs from them, on the contrary in fact, I have made some cute quotes using the fonts for you to feast your eyes on below. The bundle has 48 font packs included, with 4 bonus fonts and tons of multiple weights and versions, the real total of fonts ends up in the 60s somewhere! 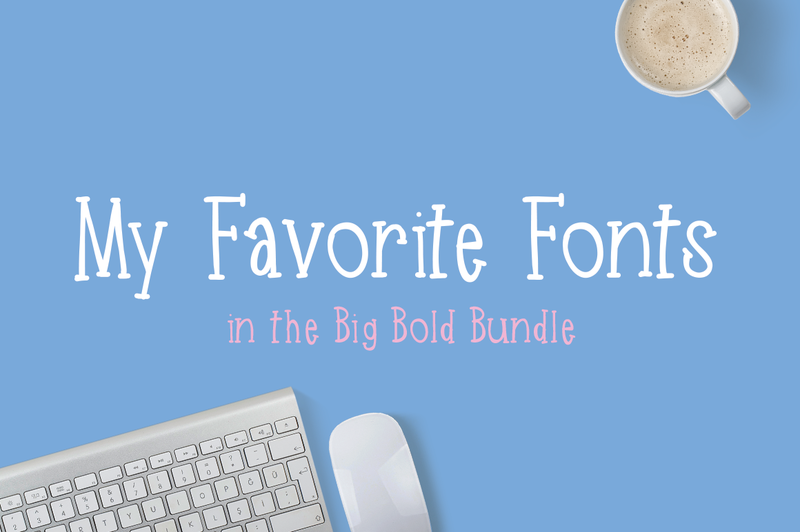 With so many awesome fonts, it can sometimes be overwhelming but whether you use them now, or keep them in your toolkit for the right moment, it’s better to get them at 98%+ off rather than paying the full price, right?! A simply gorgeous serif font that really has become a go-to font for me. I hate using the same standard font all the time and when you need a ‘straight’ font, the same three spring to mind. Now I have Endurest, that problem is a thing of the past! The typeface itself is slightly rough textured and that adds a little something extra to your work and elevates them from your bog-standard Helvetica designs to a modern day version. Also included is ‘Endurest Distant’ a more spaced version of the original font that is super useful for taglines. A modern, minimalistic serif font that is simply a pleasure to use! Included are three versions, regular, bold and italic meaning that you can use this one font and switch between the weights to keep an appealing continuity with subtle changes that are engaging yet not too full on. A fantastic font that will definitely become a popular modern classic. Never has a font name been so fitting to the font itself, furiosa is just that, fast and furious! Created to look like you have taken a huge paintbrush and created each curve with one fluid stroke leaving the ends to taper off with that brush stroke finish. Simple yet striking in so many ways, with its slight italic slant and super bold letters this font really has an edge! I’m hooked! Ok, so strictly this would be classed as a script font but isn’t it the boldest, manliest script font you have ever seen? We love the thick curves of the letters especially along the baseline and the ‘rough’ edges make for an interesting finish. This typeface doesn’t need much explanation as it really does speak for itself! This font is a little different and a little quirky and that’s exactly what I love about it! Super futuristic looking but actually based on vintage Polish artwork, go figure! I love its simple lines and the exciting added extras on certain characters. A sans, monoline font that takes simplistic beauty to a whole new level! Everglow is a retro styled font that reminds me of baseball shirts and posters. There are hundreds of glyphs included and as it is PUA encoded they are accessible to everyone. This is one of my favourites included in the bundle due to the sheer amount of possibilities with the characters. It really is like having 10 fonts rolled into one (beautiful!) package. A bold font that is super fun to use as it is actually two fonts in one! Using the lowercase you will have a strong display font that has a ‘tall’ feel to it and when using the uppercase letters you will see an awesome 3D stripe effect appear behind each character. I wish all fonts were made like this as it really is great to combine the two styles, without switching fonts! A real grunge looking font that combines rough and ready lines with sharp edges, creating a truly unique font. So intriguing and reminiscent of street art, I can’t help but love Basic Instinct! A lot of brush fonts lose their legibility when they are too small because of their jagged nature but that’s not the case here and I love combining it in my designs. Ok, so this is cheating a little as Haste is actually a set of three individual fonts but they are all so awesome that I couldn’t not include them! If you are ever looking for a serif, sans and script font that compliment each other perfectly, then you have them all ready for you here in one place! Haste is the serif font that has a bold, thick feel with quirky extras on certain letters. Then we have Belion, the sans font that stands tall and straight against Haste’s curves and finally we have Seafool, the script font made of monoline magic! Here are a couple of quotes made using the fonts included in this bundle, the first has been created using the fonts: Washington, Endurest, Bartolomew and Seafool. The sunburst in the background is a bonus illustration included in the Lawasth font. The second image was created using a pre-made quote included in the extras that come with the Godfeem font (the heart is in our current February bundle). There you have it, my favourites from the new bundle. Do you agree with my choices? Are they up there in your top ten or am I missing out that one font that was the deal clincher for you? Comment below with your favourites and if you have created any design using the bundle like ours below, then send them to hello@thehungryjpeg.com as we’d love to see them! Happy designing guys!